Arroyo Grande police arrested a felon Wednesday morning and charged him with six fresh felonies after he allegedly assaulted his wife. Cole Stacey, 32, attacked his wife after a verbal argument in front of their young children, according to an Arroyo Grande Police Department press release. When officers arrived at the home, they found a loaded weapon and a stolen rifle that were in Stacy’s control. At approximately 7:09 a.m., officers responded to a domestic altercation report in the 500 block of Cornwall Avenue. When police arrived, Stacy was partially inside the passenger side of a parked vehicle. He then quickly walked behind the residence. Police stopped Stacey and met with his wife, as well. Stacey’s wife sustained minor injuries. She refused medical treatment, though. Officers arrested Stacey and charged him with spousal abuse, child endangerment, possession of a loaded firearm in public, felon in possession of a firearm, felon in possession of ammunition, possession of stolen property. Police later learned Stacy had prior felonies. 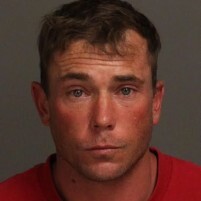 Stacey remains in San Luis Obispo County Jail with his bail set at $100,000. as long as there is victimology there will always be government…..
“Officers arrested Stacey and charged him with […] felon in possession of a firearm”. Wait; what? How do you charge someone as a felon in possession of, before learning that the person is a felon? Glad the kids are safe. I hope they all get services, as watching your parents have DV is so traumatizing. I was just glad to hear of a wife that wasn’t afraid to pursue charges. Way to often by the time police show up, the wife has a change of heart. Good for her! I was the victim of d/v many years ago. It is not so cut and dry like people think. My abuse was in the 80’s before many of these laws. I applaud a woman who can stand up and state the truth, it is not easy. She will find her way with counseling and strength in believing she is worth while. I honor you woman who say enough is enough, I know it is not easy, but you will be so much better off in the long run. You must get counseling for your weakness and that is okay. Build your self up and move on with confidence and knowledge. Self worth does not happen over night, give yourself grace and time. I am know who I am and I love me, learn to love and trust yourself, YOU ARE WORTH IT. That comes from someone who lived through it. This clown does all this just three blocks from the AGPD station house. More proof criminals are really stupid. Looks like we have a candidate for the next AG citizen of the year.